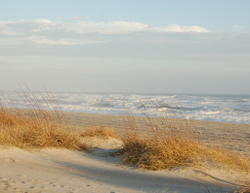 Beach season really never stops on North Carolina's Southern Outer Banks. We just have days when there are better places to be than the beach. However, the official beach season usually begins Saint Patrick's Day. Last year we had enjoyed plenty of warmth already by the middle of March. It was markedly different than the spring of 2011. This year the weather has mostly cooperated with the season opening. It has not been a bad winter but we did have some cold and cloudy days in February and now the winds are here. On top of that there is construction on the Emerald Isle bridge which will not be finished for another few weeks. The combination of cool days, wind and traffic delays on the bridge kept me away from my favorite beaches during the month of February 2013. It is rare that I miss a whole month. Somehow when I bundle up in a down vest and wind jacket, I do not feel as out of place walking along the woods by the marshes as I do over on the beach. Recently with the nice weather on the mainland, I have been able to ditch the down vest but it is always a lot cooler over on the beach early in the season. Our February warmth usually only lasts for a few hours at a time and my default action during those short warm periods is to go for a winter boat ride. Saint Patrick's Day weekend turned out to be different or at least a hint of things to come. The wind was here but we had plenty of heat to compensate. The temperature probably hit seventy degrees and our blue skies returned to go with the warmth. Construction on the bridge was also suspended for the Emerald Isle Saint Patrick's Day Festival. Of course the festival and one of the first really nice days of spring happening on the same day meant that to avoid traffic on the bridge, you needed to go early. As they say, the stars were aligned. I left home early enough to make it to the Emerald Isle Festival by 11:00 AM. I managed to get a good parking place and intended to walk around the festival and at least get a picture or two of some of the bands. Even before noon the early the crowds at the festival were amazing. We were still a long way from the stage when the river of people that was carrying me along, just stopped moving. My crowd tolerance is low so after a minute or two I finally gave up and headed back to the entrance where my favorite barbecue stand is located. I bought my barbecue sandwich, took a mouth-watering picture of all that pork on the grill and headed over to Ace Hardware to find a spot to enjoy my sandwich. It was a perfect, slightly spicy Eastern North Carolina barbecue sandwich with good slaw to top it off. Next I made my way back to my car and headed west along the beach and Coast Guard Road towards the Point. 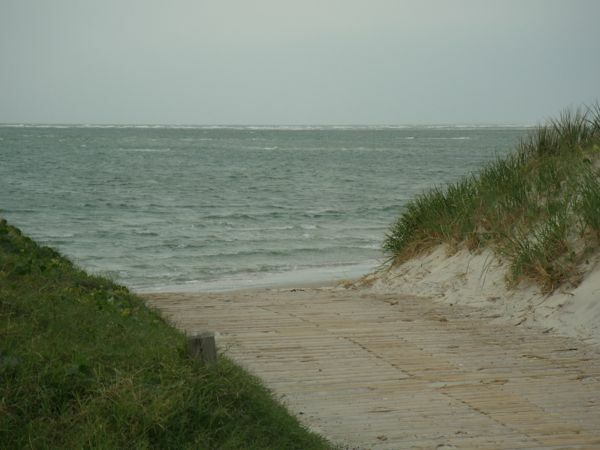 The Point is as far west as you can go on Emerald Isle. It is an amazing area and as vehicles stop driving on the beach in time for the summer visitors, the Point becomes an even more natural spot. I love to walk there because it one of those places where change is constant. I map the Point regularly to check for changes to the beach. If you look at one of my maps on Google Maps, you might wonder how I manage to walk on water. It turns out that my maps are more accurate and updated more regularly than Google's maps. The lines representing my walks on my maps are always on sand on the land side of the waves. I use my maps to make sure visitors who buy our travel guide know what is happening to the beaches. I am working on an update to our travel guide and hope to have it published by the end of March 2013. I first visited the Point in the summer of 1969 and visiting there brings back more and more memories. The Point has changed dramatically since we moved here in 2006. In November of 2007, there essentially was no Point, there was just water at the end of the vehicle ramp as you can see from this picture. Five and one half years later there is over 1,700 feet of sand where it was hard to find any in November, 2007. This picture that I took on Saturday, March 16, shows sand almost as far as the eye can see. I had a nice long walk at The Point on Saturday, March 16, 2013. I walked enough that it should be clear that beach season is here. It will be one of many walks there this year. I have posted some pictures and will add more pictures of my hike as soon as I get a chance to sort through them. This link will take you to the album where you can find my latest collection of pictures of the Point. I have been a member of City-Data forums for almost a year as dsobotta. For the most part I have enjoyed doing posts there and answering questions. Today I got banned from doing posts or responding due to "repeated deliberate" violations. This apparently was the offending post. The only thing that I can tell which was cut out was a link to email me if they had more questions. Since I had seen others use the same email tool that is available, I assumed it was okay. I guess not. Since I cannot respond on City-Data, I have chosen to respond on my own turf where I control the rules. I welcome any of the moderators to comment here. I thought I had been very cooperative and tried hard to work within the guidelines and with the moderators. However, being a Realtor® adds some special forum rules which I have struggled to figure out. I completely understand that my posts are not supposed to solicit customers, but the rules seem to go well beyond that and have a good deal of subjectivity. I went to the considerable trouble to create duplicate content at a Crystal Coast site and strip out all advertising. It was a lot of work which consumed my spare time over a few days, but I was glad to do it because it was a good way to share my pictures and information about the area. Not long ago, but prior to my banning, I got a note that all my posts were being searched for offending links to that site. After the investigation I got this note. The only link I really find questionable is the southern outer banks link. I know you don't list your realty company with it but you do have an about us and how to find realtors even though those don't take a reader directly to you. In spite of it just being questionable, all those links were purged which I thought was a little extreme since I could not even find where it took people to Realtors® other than me. As a Realtor® sending people to my competitors is something you would not normally do. However, I did not complain I just stopped updating those sites since I could not longer use them. That is why the content is not the same as my Coastal NC site. Actually even on that site you have to go to the last page to get to any information about contacting me as a Realtor®. I did that for a reason. The reason being that the site is more about being an information source for the area than it is about being me being a Realtor®. I have a number of pages and sites which are directly related to me being a Realtor®. Squidoo, My ActiveRain one, the one on our company website, Point2Agent, Zillow, and GMAC's website among others. Never on my time on the City-Data forum did I refer someone to one of my real estate sites. I also participated in the broader NC and Virginia forums when topics came up where I thought I had some information that would be of use to people. However, at this point, I can no longer post on City-Data because of "repeated infractions." I tried to respond to the message from the moderator so I could understand what I had done, but they also cut my storage so that the only way that I could respond would be throw away most of the positive emails that I had stored. In the end it does not do any good to argue (or maybe even cooperate) with moderators. I will go serve my banishment and evaluate City-Data forums again in the future. I have my doubts as to whether or not I will come back. I have actually ended up helping a number of City-Data folks but most were not as real estate clients. I have helped people decide whether or not this area is a nice place. Many have ending up liking our area but have had some challenges that have prevented them from moving to the area, or they have found a place that they liked better. Lots of times I show someone the area, and they have to find a job. I am even helping a couple of people on their job search. I like to meet people, and I enjoy showing our area so I am certainly glad for the people that I have met through the forum, but I would not call it a business windfall. My newly chosen career in the real estate world is an unusual one. We actually pay to work for real estate companies, and hopefully make up the money when we sell property. That normally works pretty well. It does not work well at all in a market like today's when you are a new agent. As a side note, if I could make enough money to live on with my pictures and writing, I would give up real estate in a heartbeat. Unfortunately everyone has a digital camera these days and most writing like I do is done for free. Real estate is one of the few places left where we old guys can work. I know people who have been in the business for a year and have sold only one property. I have done better than that, but it is hard going months without a paycheck. So could my efforts on City-Data be considered trolling for clients? Well based on the results, I would say hardly. The three clients that I am working with right now have come from the following sources. A walk-in to our Cannonsgate Office. Someone who was driving around our neighborhood looking at flyers, and I threw my body in front of their truck to answer questions. A call-in to our Cape Carteret Office. None of those people have ever heard of City-Data, and one does not even have a computer. So suspending me from City-Data probably is not going to hurt my business. Unfortunately I will not be able to post those pictures that people seem to love so much. For that I am very sad. Once again City-Data has put me out to pasture. According to one of the moderators I was up to my old tricks again. Apparently my sin was suggesting that someone send me a private message if they had any specific questions. When I told the person I was communicating with what had happened this was their response. WOW, I am shocked. I am so sorry this happened. It is not shocking if you have seen how some of the moderators stalk the people really trying to provide good information to people. I sent a note to the moderator but as usual there is no response back. My response is this post at View from the Mountain. It is an accurate assessment of social networking. Unfortunately most online forums still value themselves far more than their real worth. 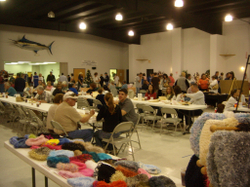 As a newcomer I had little idea of what to expect at the 27th Annual Oyster Roast which was sponsored by the Rotary Club of Swansboro and took place on March 17, 2007. The only warning I had gotten from colleagues where I work was that there would be a crowd. I was beginning to think of the Oyster Roast as some sort of initiation that new members of the community have to go through blind folded. Hearing that it was also called the Swansboro Cotillion only added to the confusion. The last time I checked a cotillion was "A ball at which young ladies are presented to society." What in the world could that have to do with Steamed Oysters? I decided to show up at 5:15 PM which is a time that I thought was pretty early for dinner. Somehow I was not surprised to find a long line of happy people snaking its way through the parking lot of the Civic Center. It was a little chilly in line, and some of the ladies were working hard to keep the line in the warmth of the sun, but it soon began moving swiftly. As I already had a ticket, I got my green wrist ban and immediately saw this room filled with strange tables with people already crowed around them and occasionally cheering. As a newcomer I had a lot of freedom to move around the tables. The first thing I figured out was that in order to participate in the fun you needed a tool and something to protect your hands. Fortunately there was a contingency plan for this situation. Two gentlemen from Sneads Ferry were selling Oyster Knives and towels that conveniently took a five dollar bill. After getting my equipment, I started searching for a spot to stand at a table. I quickly figured out that there were no spots. It seemed the first wave of Oyster eaters were still hungry and guarding their prime spots. I did discover that the cheering alternated between excitement at actually getting Oysters or trying to convince the runner that you were more deserving than the next table. Finding the steamer tables full required only a slight change in tactics. I decided to take advantage of the Fried Flounder, Barbecue, Slaw, and Chowder buffet line. I got a plate which was filled rather quickly. In fact there was no room for a Hot Dog or Chowder. After finding some iced tea, I took a seat at one of the many long tables in the hall. The Flounder very lightly breaded and fried perfectly. I thought to myself that I needed to check out these expert Flounder Fryers before I left. The barbecue was also good but not quite as good as the fresh out of the smoker barbecue I had found at the Emerald Isle Saint Patrick's Day Festival. Still the plate food at the Oyster Roast was only delicious appetizer. The real treasure of the day was waiting for me back in the Oyster Hall. On the way back I decided to take a look at the behind the scenes operation. I ran into the head of our company, who had so kindly provided me with a ticket for my first Oyster Roast. I got to meet his son, who was one of the Oyster Runners. As I surveyed the scene outside the building, I was awestruck by the size of the operation. First there were the cement mixer-like machines which washed the Oysters before their trip to the rows of steamers, then the Steamed Oysters went to buckets for delivery to the tables. At the tables the Oysters once stripped of their treasure were pushed down a chute in the middle of the table which landed them in a trash can which came back to be emptied into a front end loader which placed the empty shells in a dump truck for a trip back to the water. After figuring out the Oyster Roast operation I watched almost mesmerized as the well practiced Fish Fryers took fresh flounder, rolled it in batter, and quickly turned it into a delicious fried treat. I struck up a conversation with the Hush Puppy Man who seemed to be dropping them in the oil to a tune playing in his head. He confirmed that having rhythm was important to a good hush puppy. After snapping some more pictures of the operation, I decided it was time to enter the fray and not give up until I found a spot at a table. It took only a short time to find a spot as some of the early eaters were reaching their limits. I found a spot by someone native to Swansboro who had driven 120 miles from Lumberton to be a guide for his daughter and son-in-law's first Oyster Roast. It turned out to be a fortuitous spot since I was able to also learn at the side of a master Oyster Shucker. When I got to the table the team was just finishing up a batch. We only had to endure a few steaming buckets bypassing us before we got a huge dose of hot Oysters. I was told to start work on the hinge if possible. With minimal effort I pried out several of the treasures. Most people were dipping them in butter or sauces that they had concocted. However, I thought the perfectly salty oysters were great straight from the shell without any additional flavoring. I even ate from a neighboring shucker was found a particularly huge one that was more than he wanted to tackle. I have never had oysters this plump and juicy. I took advantage of one piece of sage advice from the Oyster Master next to me. When I got to point of thinking I could eat just one more, I stopped before I ate the one more. It was very good advice. With a belly full of oysters not to mention my appetizer plate, I could only manage to listen to the music from afar since there was a sunset about to happen on the White Oak, and it was calling me. I never did get a beer. I guess that will have to wait. I know one thing I will be back next year, and I will have a team of Oyster Eaters with me, ready to capture our own table. I am already looking forward to it. If you would like a full tour of the event check out the website of pictures I put up.